My husband doesn’t like coleslaw. I am not one to go out of my way to stick it on a menu or wrestle my way to the bowl when I see it at a barbecue, but I do eat it and normally enjoy it alright now and then. 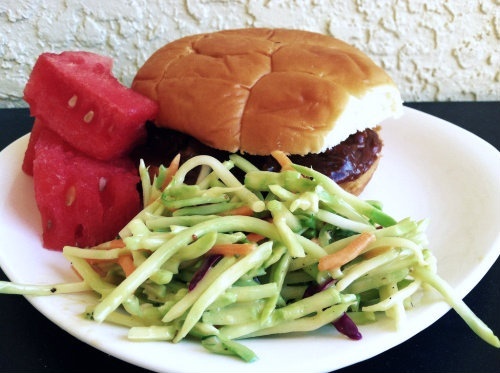 Recently I’ve been exhausted everyday after work and found this wonderful recipe for slow cooker bbq pork, which meant the lovely crock pot fairy would be cooking dinner instead of me– God bless her! I wanted a fresh, healthy side to go with to keep in light and summery since the pork would be so savory. Coleslaw is a traditional topper of pork sandwiches at bbq places, but since we’re not coleslaw crazy I went a less traditional route. Broccoli slaw, which I’ve seen in stores but never known what it’s for, was the perfect answer. We love broccoli and it was so crisp and fresh, perfect for summer. The big difference was the avoidance of the standard mayo and vinegar that really gives coleslaw its flavor. Instead, I did a light honey-dijon dressing which gave it the coleslaw feel but with a totally different and delicious flavor. I highly recommend trying out this new twist on a classic summer side dish—it is sure to please everyone, coleslaw lovers and not-so-lovers alike!